So Where Do the Numbers in Government Reports Come From? Last week, the COI (Central Office of Information) released a report on the “websites run by ministerial and non-ministerial government departments”, detailing visitor numbers, costs, satisfaction levels and so on, in accordance with COI standards on guidance on website reporting (Reporting on progress: Central Government websites 2009-10). As well as the print/PDF summary report (Reporting on progress: Central Government websites 2009-10 (Summary) [PDF, 33 pages, 942KB]) , a dataset was also released as a CSV document (Reporting on progress: Central Government websites 2009-10 (Data) [CSV, 66KB]). Whilst I firmly believe it is a Good Thing that the COI published the data alongside the report, there is a still a disconnect between the two. The report is publishing fragments of the released dataset as information in the form of tables relating to particular reporting categories – reported website costs, or usage, for example – but there is no direct link back to the CSV data table. There are also columns headed SEO/SIO, and HEO, for example, that may or may not relate to costs? (To see all the headings, see the CSV doc on Google spreadsheets). But how does the released data relate to the summary reported data? It seems to me that there is a huge “hence” between the released CSV data and the summary report. Relating the two appears to be left as an exercise for the reader (or maybe for the data journalist looking to hold the report writers to account?). The recently published New Public Sector Transparency Board and Public Data Transparency Principles, albeit in draft form, has little to say on this matter either. The principles appear to be focussed on the way in which the data is released, in a context free way, (where by “context” I mean any of the uses to which government may be putting the data). For data to be useful as an exercise in transparency, it seems to me that when government releases reports, or when government, NGOs, lobbiests or the media make claims using summary figures based on, or derived from, government data, the transparency arises from an audit trail that allows us to see where those numbers came from. 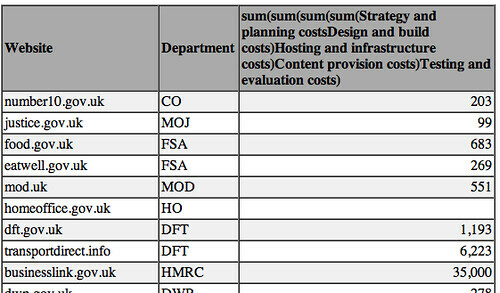 So for example, around the COI website report, the Guardian reported that “[t]he report showed uktradeinvest.gov.uk cost £11.78 per visit, while businesslink.gov.uk cost £2.15.” (Up to 75% of government websites face closure). But how was that number arrived at? In short, it seems to me that releasing the data as data is a good start, but the promise for transparency lays in being able to share queries over data sets that make clear the origins of data-derived information that we are provided with, such as the total non-staff costs of website development, or the average cost per visit to the blah, blah website. SIO, SEO and HEO are references to (permanent) staff grades. I’ve been wondering about the need for a ‘Show Your Working’ convention for open data use – building on the need to at very least note the source (http://www.timdavies.org.uk/2010/06/04/open-data-requires-responsible-reporting/). In addition, users should also be able to ask a question about how to acquire a certain dataset, or run a particular query, and get a worked example, as described above, offered to them as a response/answer to their question. I did wonder whether a Stack Overflow site (e.g. http://area51.stackexchange.com/proposals/10408/linked-data-queries ) might be minimally useful in that regard, but I think the ability to run, preview and edit (or clone and edit) queries is where the power would come in?